If Congress moves to create a Space Force, the additional billions of dollars needed to stand up a new service would have to be funded at the same time the Air Force is seeking a significant increase to the size of its combat force in response to growing demands. NATIONAL HARBOR, Md. 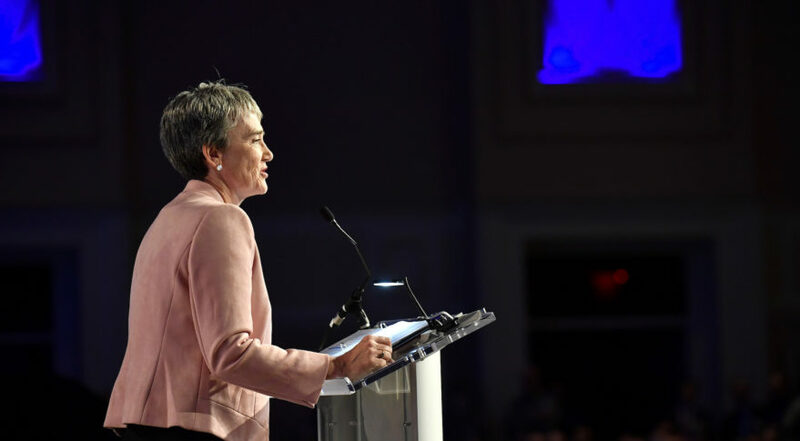 — Air Force Secretary Heather Wilson said her initial $13 billion cost estimate to stand up a Space Force and sustain it for five years is likely to be revised upward as more data is crunched. In a detailed memo submitted on Friday to Deputy Defense Secretary Patrick Shanahan, Wilson provided the first glimpse into the potential cost, size and makeup of a military branch for space. The $13 billion projected cost over five years is based on a force of 13,000 people, including a headquarters of about 2,400. The numbers, which were produced by Air Force cost estimators, “strike me as conservative,” Wilson told reporters on Tuesday at a news conference during the Air Force Association’s annual symposium. Wilson did not specify how much higher costs could go. Wilson said several more studies will be done over the next six months to come up with a precise estimate of future demands. Funding to increase the size of the Air Force would not be requested in the next budget for fiscal year 2020, which already has been submitted to the Defense Department’s comptroller. “This is a longer term proposition,” said Wilson. The funds to stand up the Space Force, however, would have to be added to the 2020 budget according to Shanahan’s Sept. 10 memo that lays out the plan for implementing President Trump’s order to create a separate branch of the military for space. Wilson’s proposal takes issue with some of the directives in Shanahan’s memo, such as the appointment of an assistant secretary of defense for space. Wilson called that unnecessary bureaucracy. She also disagrees with the deputy defense secretary’s decision to not include the National Reconnaissance Office in the reorganization. Wilson’s proposal is insistent the NRO and a new Space Development Agency should be in the Space Force to ensure acquisition is closely connected to space operators. Critics have described Wilson’s cost estimates as overblown in an effort to dissuade lawmakers from supporting the breakup the Air Force. Space industry insiders speaking on condition of anonymity said Wilson’s high cost estimates and recommendation to include the NRO in the Space Force are “poison pills” that could derail the reorganization. They also question why Wilson is asking for 13,000 new people to form the Space Force, instead of moving more existing personnel into the new service.